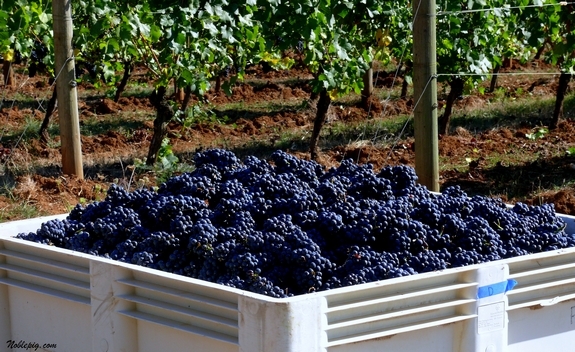 It’s harvest time in the Willamette Valley and we are blessed with more than perfect weather. Most grapes reached optimum ripeness last week but were left on the vine for increased flavor development. This was possible because there was no rain in sight. The 2009 vintage is shaping up to be very, very promising. I can’t wait to taste the amazing wines these grapes will make. My weekend started a bit early this week due to the fact my boys did not have school on Thursday or Friday. So, Wednesday night the hubby and I went out to dinner with our friends Wayne and Nicolette. We went to what is shaping up to be one of the hottest new restaurants in our town, Thistle. They have been featured in Sunset magazine, Food & Wine and many other local publications. We feasted on heirloom tomatoes with Green Goddess dressing, homemade gnocci with chard and chanterelles, freshly caught local Sturgeon and rabbit loin wrapped in bacon. It was all amazing as always. Thanks to owners Emily and Eric who always make our visit so special. Our friend’s Wayne and Nicolette also own Youngberg Hill Vineyards and Inn where my kids spent the better part of their Thursday afternoon. All our kids ran through the vineyards together, farm dogs and farm cats in tow. They had a blast. 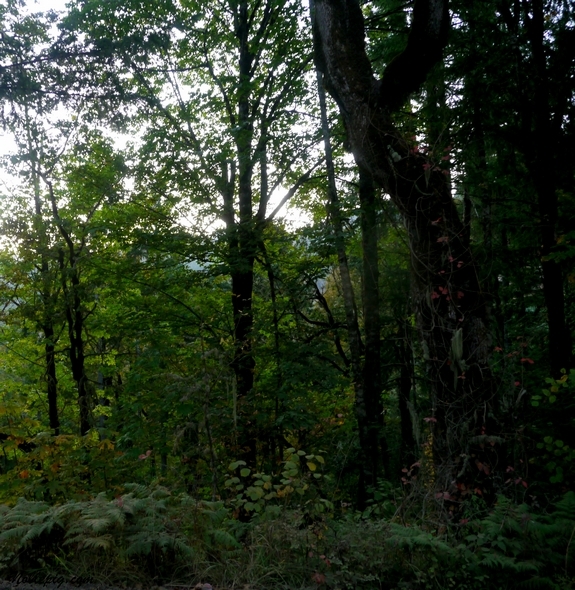 Youngberg Hill is one of the most beautiful Inns here, perched high atop the valley. It is an exquisite place to stay or to stop by for some wine tasting if you find yourself in town. This weekend also included stopping at this place…. For some of this. I just can’t resist diner pie. Of any kind. Walks in the forest are always exciting. We also worked in on our own vineyard property…can you see the sticks are becoming more and more scarce. Do you also think that out of three pictures everyone could have their eyes open or not be making a weird face? Apparently not. Oh finally, eyes are open! 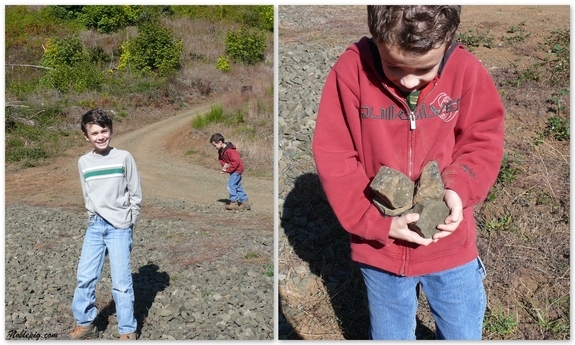 Rock pickin’ goes along with stick picking when you have boys. 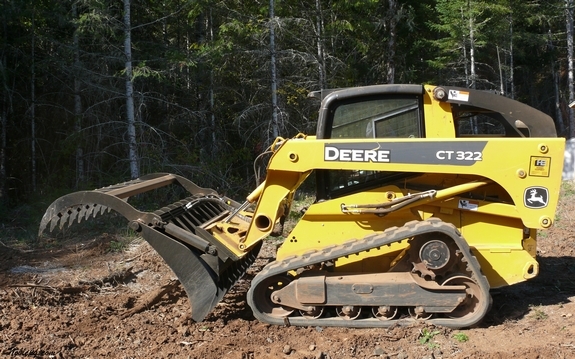 This is our new John Deere Skid Steer we are using for land development. It was important for us to buy a piece of equipment that was tracked instead of on wheels so we can utilize it through the rainy winter. So far we are very happy with it and it has proven to be quite the Swiss army knife, in other words, it can do anything. Perfect. 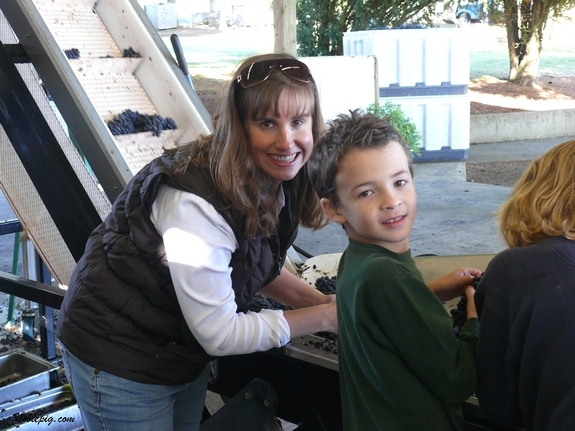 The highlight of our weekend was spent at our friend’s winery, Coleman Vineyard, helping them process their grapes for harvest. It is an honor to be helping at their winery as they make some of the best Pinot Noir in town. Our friend’s John and Jody, are making their first vintage wine at the Coleman’s winery. We are so excited for them, we know what it takes to get to this point and it was very exciting to be there with them sharing this moment. 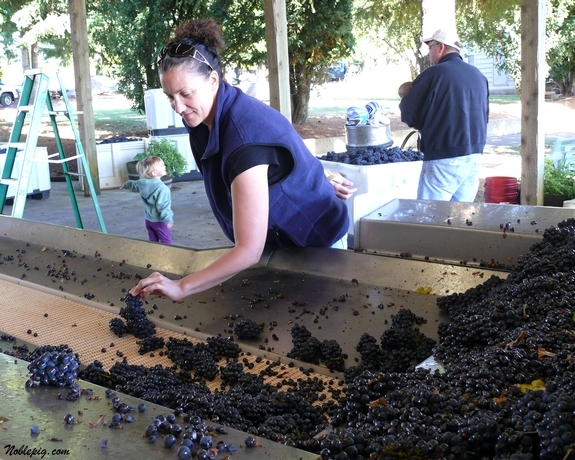 Here Jody is sorting the Pinot Noir, pulling out any MOG (matter other than grapes), things like leaves, bugs and sticks you don’t want in the fermentation tank. 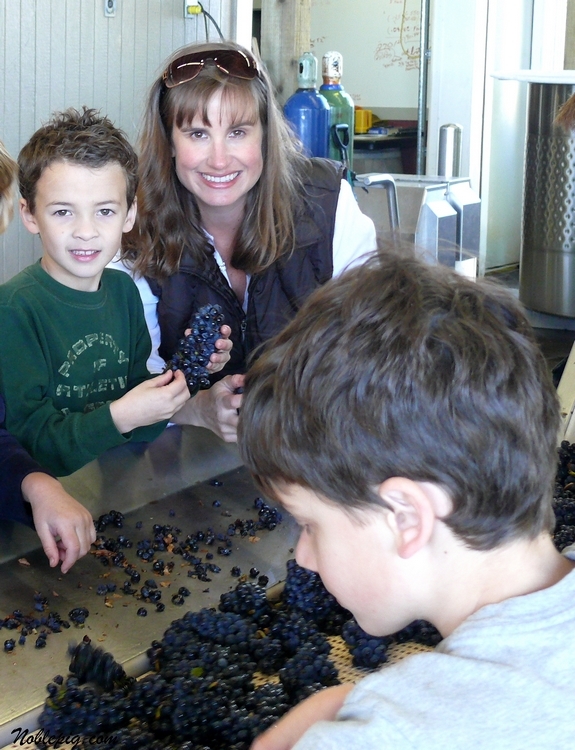 In small family wineries, all the kids help out with the winemaking process. Here is my oldest on the sorting line as well. Sorting until your hands are so cold you can no longer stand it. Pretty brave of me to be wearing white wouldn’t you say? The bin full of grape stems was getting pretty full so we threw some kids in to stomp them down. They loved it. I have to say, just when we think it can’t get any better here, it does. We love it here and feel so very lucky to be surrounded by so many great people. Also, the FoodBuzz award nominations were released. Thank you to everyone who nominated me in the category, “What blogger you would most want to be your personal sommelier?” Well, I would love to be your personal sommelier, so go and vote! Thanks again. I love that you’re settling in nicely out there, making lots of new friends and living well. Your sons seem to have taken to the area wonderfully and I look forward to your new posts. Good to see you in your brave white t-shirt! It is such an amazing privilege to raise our kids so close to nature and what it has to offer. We are truly blessed!!! I love seeing your family involved in activities in your new home and community, and also working toward your goal! Thank-you for sharing such a personal journey toward fulfilling your dream. The Hooligans are growing up so quickly and becoming handsome young men. 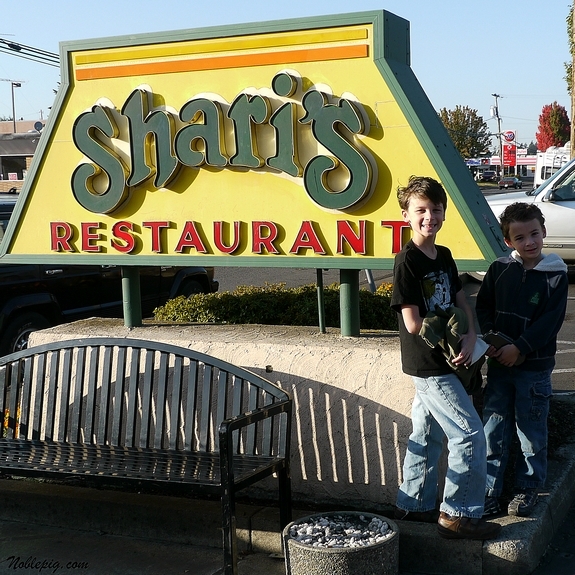 We know where we will have to stop and dine when we make it back to one of our favorite places, Oregon wine country, thanks! This was a great post Cathy! I am posting my cheese fondue recipe today which you gave me the advice on which wine to purchase! Thanks so much! Wow, what a wonderful weekend! 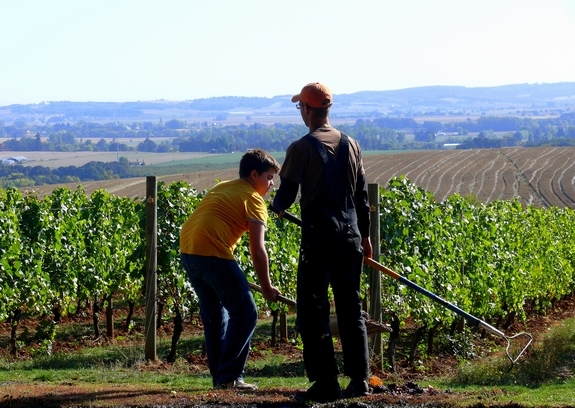 I love that the boys are learning what the vineyard/wine business is all about even before your first plant is in the ground. 🙂 Oooh, I’d love to stay at that inn–it sounds totally divine. That looks like more fun than our pumpkin picking trip! Yours boys are super cute. Off to vote for you. You deserve it.. I didn’t realise how long I’d been away until I read your post, Cathy. You’ve harvested! Wow. If you plan on selling your wines online (and deliver to Timbuktu, okay Malaysia) I’d love to know. Love these pictures. I can’t wait to try Thistle next time we’re there. We almost stayed at Youngburg Hill then switched to Dundee Manor. Both are such beautiful places. Thanks for the post. WOW, I totally agree that you are in a wonderful place. 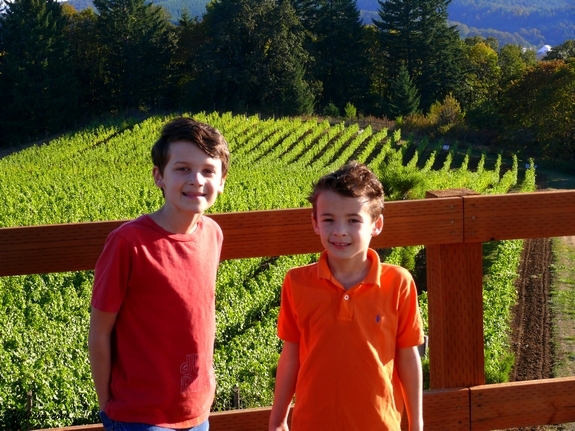 I love the way your children are included in everything and such a great experience it is for them, growing up in a winery environment, with the possibility of inheriting the winery and keeping it going for generations. And to think that you will be the one responsible for it all! You are truly blessed with two adorable boys. Thanks for sending that Foodbuzz site. I will certainly vote for you! There are some really wonderful food and wine blogs out there, but yours will always be my favorite. Your personal touches with pictures of the children and your property keep it so very interesting, and your food photography is as good or better than all they others. I just love to try your recipes. My husband has really enjoyed being the judge of most of the recipes and so far he has loved them all. So keep those entries coming, good luck with the vineyard preps, and I am looking forward to tasting your wine. Fun! Now, do you drive that John Deere? Looks like the rains are finally coming in. The grapes are so beautiful. Great pictures. What a great weekend! Food, pies, wine…and yes, you were VERY brave to be wearing a white shirt! I voted for you but really your blog is so much more interesting than a regular old food blog. Keep posts like these coming. I wish more people would publish stuff about their life. Thanks! Your weekend sounds like a lot of fun! I am jealous since your weather looks a lot warmer than ours was! I know you and your family must be having the time of your lives. It shows in each and every face. Congratulations! I am so glad you are happy in your new town. What a fun filled weekend. I went and voted for you – congrats on the nomination. it looks like a wonderful weekend! 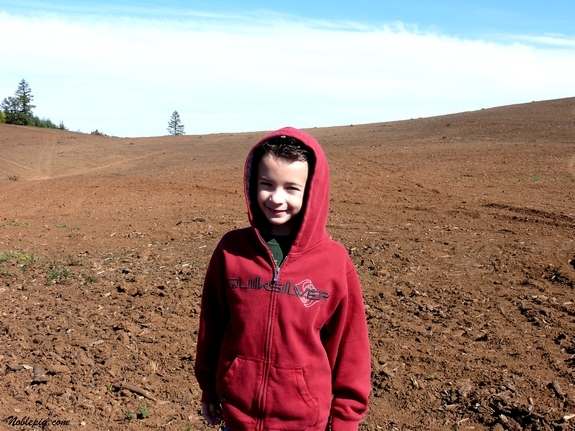 Farms and little boys go together well; with dogs and cats thrown in, how could anything go badly? Your happiness is infectious. I love posts like these, a slice of life is so ineresting! Beautiful countryside there. Congrats on enjoying life so much. What a lovely weekend! Mmm. Pinot Noir! Looks like you guys are settling in beautifully up there! 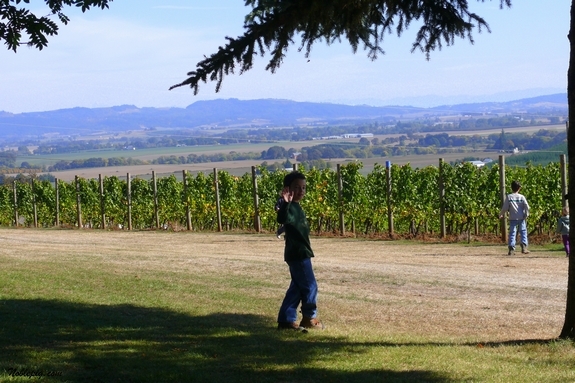 One of these days we’re going to head over there and take a holiday in the Willamette Valley. It’s posts like this that really make me miss living in the PNW. Really really enjoy the pics of the boys and you on the sorting line and would LOVE to more about that process. Well, I’d love to know more about the entire wine making process in general! I love your new feature, Weekend Wrap. Great shots of everything. Amazing life, amazing pics…I love these weekend pics! You were a star in school and now here too…keep up the good work. Looks like a great weekend. Glad you’re getting settled in so easily. Love all the photos and updates! Wow–sounds and looks like a fantastic weekend! Those grapes are beautiful!! Harvest is such a wonderful time! Once at the lake, we were invited over to Fall Creek Vineyard to help pick grapes & it was one of the best times of our lives. Both kids still remember what fun it was. Cathy, your boys are growing like weeds! I see a lot of change in your oldest son… especially height. Some day they are going to be so thankful that you moved them to wine country. I’ve spent the better part of my morning just catching up on your posts. Apparently, Google didn’t update you on my blog for like 5 days. Grrr! 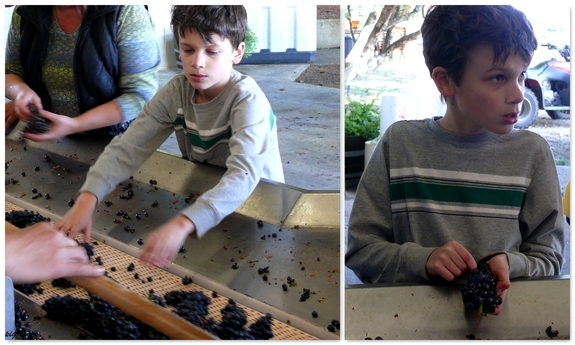 Grape sorting looks like fun! 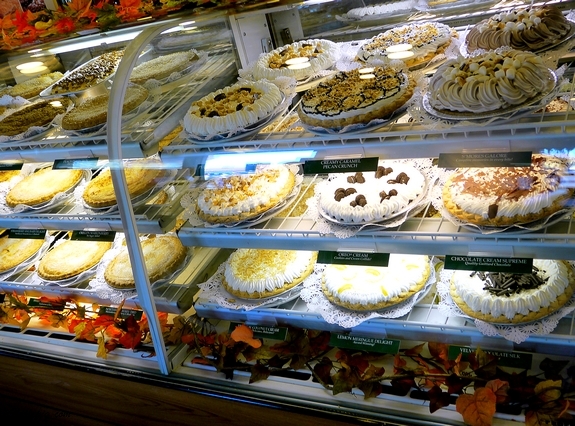 And, who could resist those pies? is it me or did your tallest boy just get taller all of a sudden? Great photos! I love seeing the progress being made at your vineyard. Your boys are sure getting big. That looks so fun! Isn’t Oregon great? If I had the money, I’d buy some land and start an agriculture business. The climate here is perfect for certain crops. I am totally making that cheddar soup soon! The change in weather has got me cooking like crazy again. Last weekend I made Julia Child’s boeuf borgignon, and boy was it good! Yay for grapes, wine, early fall weather, and cooking! What a great weekend! My husband was in Oregon for work a few weeks ago and did some wine tasting at Panther Creek and some other wineries around there, wish I could have come with him. Congrats on the foodbuzz nomination, will vote! What a beautiful area. Those grapes made me drool. So since I voted for you to be my personal sommelier, does that mean you’ll do it? Of course I’d want you to create an entire menu and actually cook the food to go with the wines. That’s not too much to ask, is it? How fun and charming your life is right now. And I also love diner pie. I don’t want to talk about my weekend… But oh my gosh, yours looks so fun! You have made so much progress on your land! And the boys look like they are enjoying their new life in Oregon! 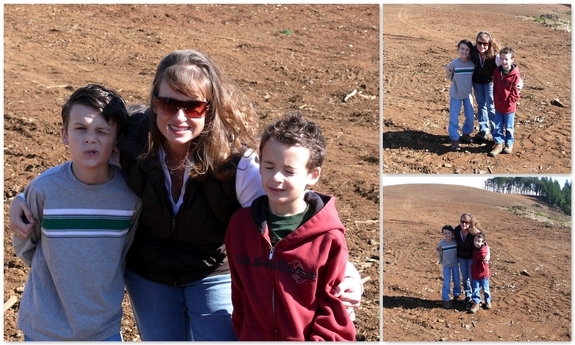 It’s so wonderful to see you and your boys enjoying your new life here in Oregon! Good friends, great views, family time … good memories in the making! What a gift you’ve provided to your young fellas! That looks like so much fun.